Violence in Iraq rose sharply in April, killing 460 people according to AFP figures, as May started off with attacks that left 13 people dead yesterday, including six police and four anti-Qaeda fighters. The majority of the April deaths came during a wave of unrest that began near the end of the month when security forces moved on anti-government protesters in north Iraq, sparking clashes that killed 53 people. Dozens more people died in subsequent violence that included revenge attacks on security forces, raising fears of a return to the all-out sectarian conflict that cost tens of thousands of lives in Iraq from 2006 to 2008. Protesters have called for the resignation of Prime Minister Nuri Al-Maliki and railed against authorities for allegedly targeting the people with wrongful detentions and accusations of involvement in terrorism. Unrest in April also wounded 1,219 people, according to the AFP figures, which are based on reports from security and medical sources. Among the dead in April were 54 police, 53 soldiers, 14 Sahwa Anti-Qaeda militiamen, and two members of the Kurdish security forces. The wounded included 171 police, 76 soldiers, eight Sahwa fighters and five Kurdish security forces members. The majority of the rest of those killed and wounded in April were civilians, although the figures also include some gunmen who died or were injured in clashes with security forces. In March, 271 people were killed and 906 wounded in violence, though those figures only included security forces and civilians. The month of May began with more deadly attacks. 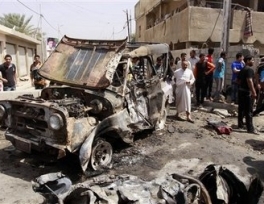 A suicide bomber targeted Sahwa militiamen in Fallujah, west of Baghdad, killing a police officer and four Sahwa, while a car bomb in Ramadi killed three police and another in the capital left three more people dead, security and medical officials said. Gunmen also attacked a checkpoint near Tikrit, north of Baghdad, killing two more police. “Conditions have definitely worsened in the country,” said John Drake, an Iraq specialist with risk consulting firm AKE Group. “If the government fails to contain the unrest and address some of the grievances of the protesters, the momentum could certainly build and lead to a reemergence of widespread violence,” he said. 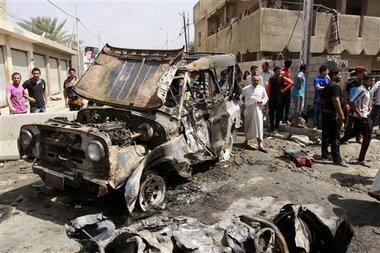 The wave of unrest at the end of April raised fears in Iraq of a return to sectarian conflict. Maliki has warned of “those who want to take the country back to sectarian civil war,” and also said that sectarian strife “came back to Iraq because it began in another place in this region,” an apparent reference to Syria. The civil war in neighboring Syria pitting rebels against the regime of President Bashar Assad has killed more than 70,000 people. Abdulghafur Al-Samarraie and Saleh Al-Haidari, top clerics who head different religious endowments, have held a joint news conference in which they warned against sectarian strife. Violence in Iraq has fallen from its peak during the height of the sectarian conflict in 2006 and 2007, when death tolls of over 1,000 a month were reported. But attacks remain common, with people killed on 29 of the 30 days in April, and more than 200 people dead in unrest each month so far this year.